Last week we have learned how to upload a simple list of names (separated with commas) from a text file into Microsoft Access Table. 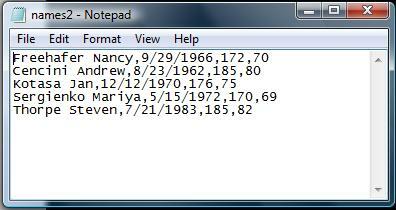 Now, we will improve that program little bit more to add few fields (Name, Birthdate, Height and Weight) to each record. The sample text file image is given below for reference. The text file have fixed number of items on a single line. All the four items belongs to a single record. In last week's example we have used a single column in Access Table for output and number of items on each line in text file were different. Since, all the items belongs to a single output column on Access Table we need to determine how many items are there in the x_Names Array, put by the Split() Function from a single line of text and we have used Ubound() Function to take the count of items in the output Array.
' : comma separated text data. MsgBox Err & ": " & Err.Description, "NamesList2()"
As we did in the earlier example, first we are attempting to create a new access table with four fields. 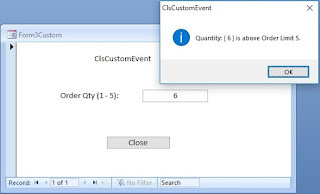 If the table creation process end up with error code 3010 then the table already exists and continue to execute from the next line, skipping the table creation process. If it ends up with any other error code then the program terminates. Opens the text file for reading the text data, each line at a time. The Split() function breaks up items in the line and loads into the x_Names Array. Next step is to add a new record into the access table, take each item from the array element and load it into the corresponding data field before updating them on the table. We know that each text line have four items and they are in which order. Only we need to know the array index numbers to read the items and load them into the fields. Split Function uses zero based index system to store the items in the array in memory. Since, we have only four items on a line the index numbers will be 0,1,2,3 to address each item in the array in sequence, Name, BirthDate, Height and Weight as shown in the program snippet given below. The first code snippet is good for beginners and easy to understand. But, it is not an efficient method when more items are there on a text line to upload. The second code is more compact and doesn't address the field names directly. If any of the field name changes at a later stage the first code snippet will run into error but the second code will work without errors. Number of items on a line is also taken care of automatically. The first code cannot be used for a different table, but the second code snippet works for any table without change.